Mexico’s colonial gem of Oaxaca honors every Catholic holiday, but nothing is as colorful or fun as the Festival de la Noche de Rabanos, a world-class Christmas family vacation. Oaxaca, Mexico is one of the country’s better-kept secrets. A center of craft and culture, it is, at first glance, an obvious mentor to New Mexico’s Santa Fe. Although we love visiting Fanta Se (as it’s known around my house), the interminable high style, high prices, and haute culture can be too much with children. In Oaxaca, it’s still real, with a strong Mexican and Zapotec Indian heritage, artisans creating exquisite black pottery, the region’s finest rugs, sophisticated folk art displayed in modern Outsider Art galleries, and several excellent, go-ahead-and-drink-the-water restaurants to suit even fussy young eaters. The classic Zócalo, Oaxaca’s bustling town square lined with 19th century neoclassic buildings, draws visitors from all over the world. The major Catholic holidays are celebrated with lavish religious pageantry at the Iglesia de Santo Domingo and the Catédral facing the Zócalo. Christmas is the most magical time to visit. Oaxaca, Mexico. December 23rd. Noché de los Rábanos. The legendary-amongst-travelers Night of the Radishes or rabanos, and what I mistakenly imagined was its Rose Bowl-style parade of radish floats, was what drew us to Oaxaca in the first place. 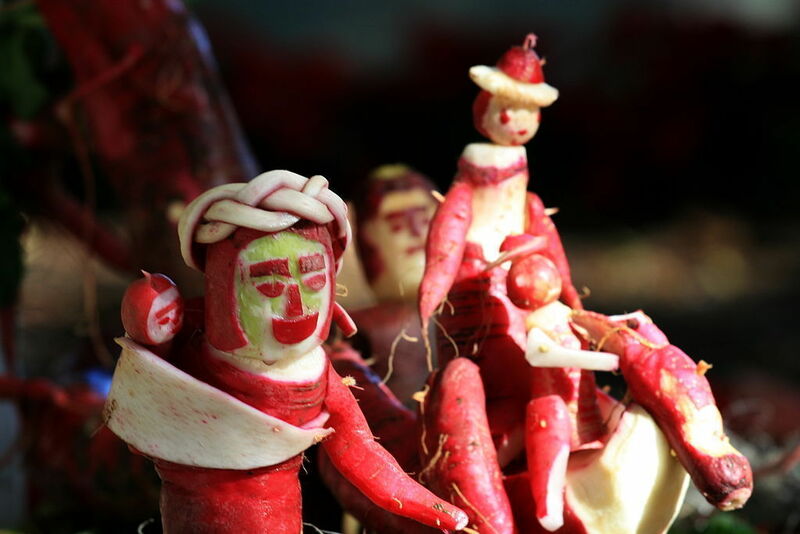 In the much more interesting reality, the spectator’s parade, and the radish sculptures remain stationary! 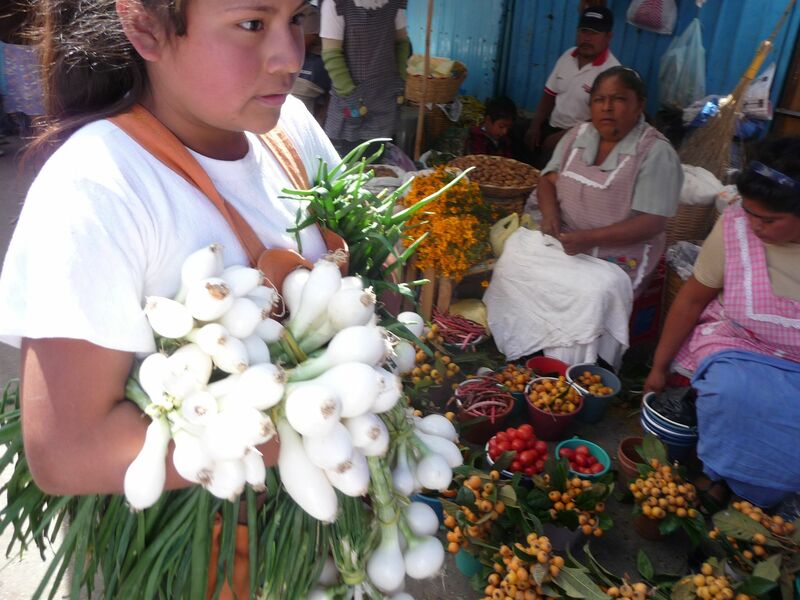 Midday, radish carvers from surrounding villages descend on the Zócalo to man their booths and begin assembling creations from root vegetables. There was also a large area set aside for children’s carvings, each one numbered for a later judging. The cafe tables and vendors that hog the outer perimeter of the Zócalo kept sculpture-admirers tightly packed around the booths, shuffling past slowly to inspect and photograph the carvings. Tables topped with balloons and birds crafted from local flowers add even more color. Besides many classic scenes, such as the Nacimiento (birth of Christ) or Danza y Musica (Mariachi bands or figures doing folk dances), there were radish girls holding flowers, and even a marvelous Vendedor de Chapulines, a grasshopper seller. Since my husband ordered fried grasshoppers, a local delicacy, for lunch the day before, we were fascinated by these larger-than-life sculptures. Other sides of the Zócalo had cornhusk tableaux and scenes made of dried mums. I must note that some tourist families we spoke with (usually from smaller towns) were upset by the squash of crowds. We, used to the New York subway at rush hour and able to hoist our son up on shoulders, found it totally acceptable. As part of the 10 days of festivities leading up to Christmas Eve, children sell dyed eggs filled with confetti. You are meant to buy some and smash them on each other’s heads for good luck. Candy and toys are also bought for children in full force. But, my son asks, “Where is Baby Jesus?” He asks repeatedly because the gorgeous nasciamentos (crèches) seen in front yards, shop windows, restaurants and church naves each have an empty manger. The answer will soon reveal itself. Oaxaca, Mexico. December 24th. La Noche Buena. Las Calendas (parades) tonight are streams of bands interspersed with dancing papier mâché giants whose arms swing in time to the music and marmotas, lovely translucent spheres lit from within and carried aloft on poles. Following behind are truck-mounted floats belonging to the major churches of Oaxaca. On this night, each household carries their own Baby Jesus, following behind their church’s mariachis or float as the calenda winds its way through town, past the Zócalo and back to a Midnight Mass, where all will be blessed. There are little girls dressed as angels, finely-costumed adults carrying paper torches and tall candles, and spectators with spiral-coiled sparklers waiting for a light. It’s noisy, bright, and captivating, and a genuine Mexican ritual. Oaxaca, Mexico. December 25th. Dia de la Navidad. Our Christmas is somewhat anticlimactic. The streets are quiet, as activity turns inward to the home, where an afternoon comida navideña is shared. At our inn, Posada de Chencho, Sñr. Inocencio has invited all guests to a cocktail party and Christmas supper. Later in the day, about 30 of the señor’s grandchildren arrive, ready to try and burst the beautiful piñatas hanging over his garden. The three large piñata stars, of red, yellow, and blue tissue and glitter, had hard ceramic bowls at the core filled with candy and small toys. 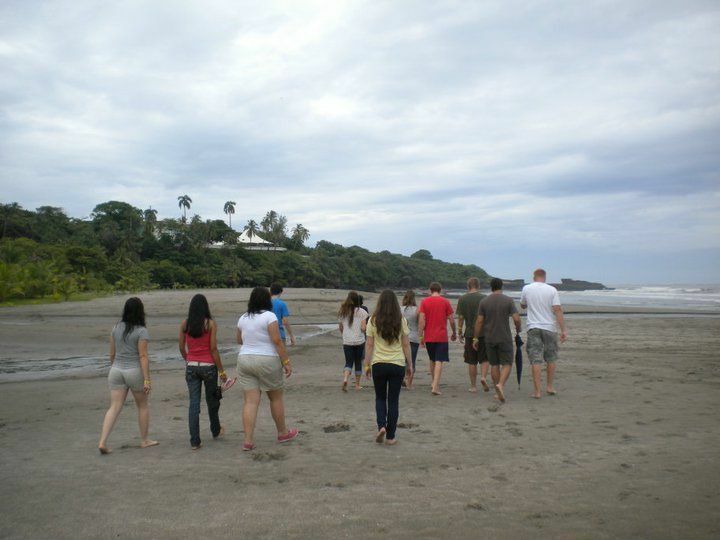 If you go, plan to spend at least five days in the region. Besides the many fine galleries and shops, Oaxaca, Mexico has an excellent archeological museum and a unique collection of Mexican pottery in the Rufino Tamayo Museum. Both are spacious and welcoming to children, who can see a lot but obviously not touch. Within an hour’s drive (or cheap public bus ride) from the city center, families can touch and interact with the historic archeological site at Monte Albán. 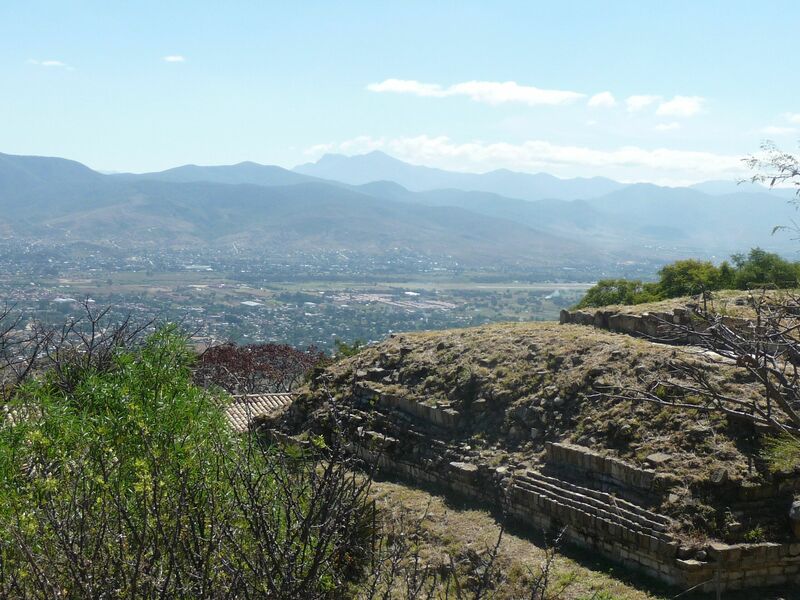 An entire Zapotec city of temples, sports fields and housing from the 1st century B.C. can be climbed upon, hidden in, and explored above and below ground. 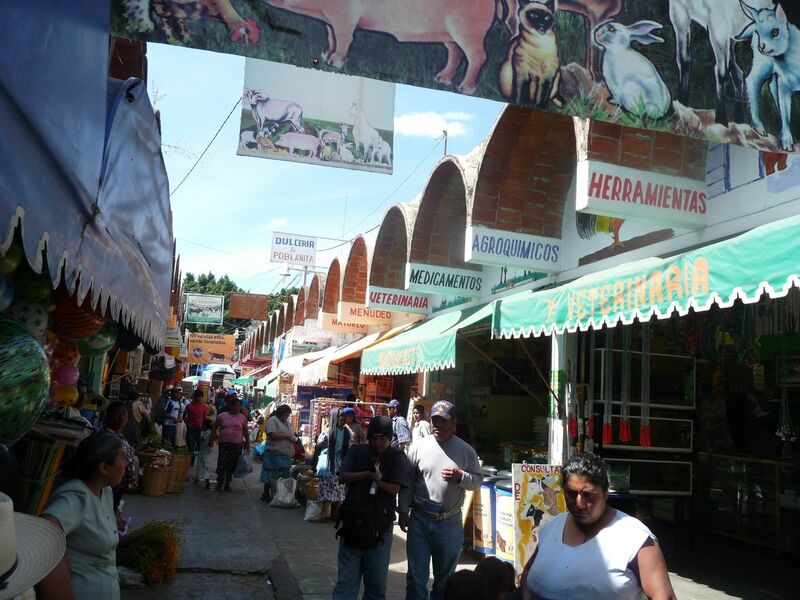 Many villages in the surrounding valley are crafts production centers or have wonderful market days, when their Mercado features produce, livestock, household items, or all of the above. All of these can be reached by inexpensive taxis or colorfully uncomfortable public buses. 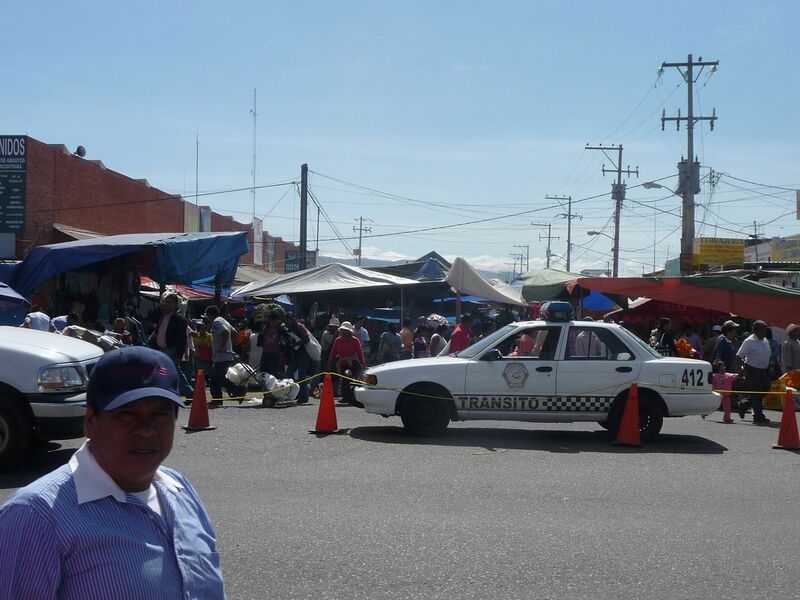 The very typical market at Zaachila was our favorite. At Teotitlán del Valle, men, women, and children work at looms, weaving traditional Zapotec patterns of birds, stripes and shapes in brightly colored wool. In nearby Arrazola, you can visit many small homes where wood carvers are turning out the polka dot-painted cats, striped lizards, and other fantastic animal carvings which endear the region to interior decorators. The kids in our group loved watching the craftsmen at work. Atzompa is a village known for its wonderful ceramics and painted clay; San Bartolo Coyoteca is the craftsmen’s village where the extraordinary (and extraordinarily durable, thus easy to tote home) incised black pottery of Oaxaca is made. This state houses many of Mexico’s most famous artisans. However, the squeamish should skip a visit to this relatively unprosperous rural area, where the impoverished lifestyle of some residents can be overwhelmingly sad. According to the Mexico News Bureau, the festival began more than a century ago, when vegetable growers put up stands during the Christmas season to sell their produce to the public. In order to make their booths more attractive to passersbyers, the growers carved designs out of their produce, and radishes lent themselves particularly well. Demand grew for these delightful radish creations, which soon became sought-after centerpieces in homes during the holiday season, and competition among growers for the best design grew as well. The radish festival started with Oazacan Mayor in 1897 and has been a tradition since. Today, artists compete for cash prizes at the festival as well as recognition for their hard work and creativity. If you can’t get to Oaxaca, Mexico at Christmas, don’t worry. Guelaguetza is another extravagant festival that lasts for nine days each summer, a time when local artisans show off artistic representations of the different regions of the state. And come late October (coinciding with Halloween), all of Mexico turns its attention to the Day of the Dead or Dia de los Muertos, an annual holiday filled with music, dance, costumes, revelry and altar worship that celebrates the dead and their legacy for the living. And of course, Oaxaca, Mexico does it better than anywhere else. Traveling during the holidays? See our round-up of holiday lights celebrations across America.